The COBB AccessPORT for the Nissan GTR is constantly being updated, in this latest release, they have support for speed density(map) sensor tuning, high power maps for more base power, and throttle control. Check out the release below for more information , dyno charts, and video. They are still working on a AccessPORT for the 2012 Nissan GT-R, and getting the LC4 to work with the early model cars. COBB Tuning continues to break new ground in the Nissan GT-R R35 tuning world with the latest round of updates for the AccessPORT. Speed Density logic has been added to the AccessPORT and AccessTUNER capabilities, enabling the tuning of large turbo builds and very high horsepower applications using the stock ECU. This big news is further bolstered by additional vehicle support for the 2009 JDM VSpec GT-R and a beta release of High Power Off-The-Shelf maps that extract even more power from the engine without requiring a custom tune. Read on to learn how the easiest and most convenient tuning solution for the Nissan GT-R R35 continues to lead the GT-R tuning industry with sophisticated tuning tools and the most sought after features and functionality! In stock form, the R35 ECU measures airflow using a Mass Airflow (MAF) sensor located in the stock intake system. Large turbo and very high horsepower applications move so much air that they exceed the MAF sensor’s maximum capacity and make MAF based tuning impractical. For these types of vehicles, COBB Tuning has implemented Speed Density tuning logic in AccessPORT firmware and AccessTUNER software, allowing these big-build GT-R’s to be easily tuned using familiar tuning tools and leveraging the convenience and sophistication of the OEM ECU. This powerful new tuning logic is available to both professional tuning shops in AccessTUNER Pro and experienced end-users in AccessTUNER Race. Since Speed Density is designed for big power builds with unique modifications, Off-The-Shelf maps are impractical and each vehicle will require custom tuning. The all new GT-R Tuning Guide clearly explains the tuning process for both MAF and Speed Density tuning for pros and experienced DIYs alike. The 2009 JDM VSpec GT-R is added to the growing list of supported Nissan GT-R R35 vehicles, bringing the total up to 19 unique applications spanning multiple model years, regions and hardware specifications. 2009 JDM VSpec GT-R's now get the simplicity of large power gains at the push of a button accompanied by a host of interactive features and functionality the AccessPORT provides with it’s vibrant color screen and intuitive interface. The AccessPORT allows on-the-fly map switching through the GT-R’s cruise control system, allowing the user to change maps from, say, a conservative daily-driving map to a high-boost, big-power map with just the push of a button. To take further advantage of COBB Tuning’s map switching capability on the GT-R, each of the individual 9 map slots can now have unique throttle mapping to provide different throttle response for each map. This puts even more vehicle performance, response and customization at the driver’s fingertips. Literally. If you are not familiar with Map Switching on the GT-R, the following video should explain how easy it is. 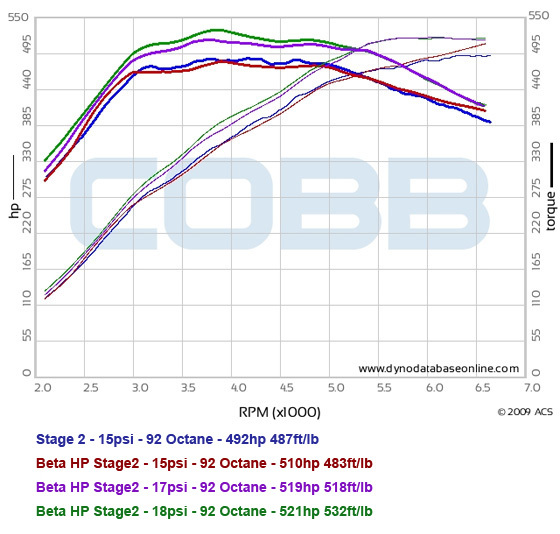 Based on customer feedback, COBB Tuning has released a full set of Beta High Power (HP) Off-The-Shelf maps for Stage1 and Stage2 cars. These HP maps close the gap between our standard GT-R Off-The-Shelf maps and a full custom tune performed by a professional tuner. The Stage2 Beta HP maps, on their highest boost setting, have generated 30HP and 45TQ peak over the standard Stage2 Off-The-Shelf maps and show gains of up to 45HP at 5670RPM! With great power comes even greater responsibility, and these maps are no exception. While these maps make more power, they do so by utilizing the stock fuel system to its absolute limit, and in some cases the demand placed on the fuel system may exceed its capacity to deliver adequate fuel to run safely. Data logging vehicle performance is an absolute requirement when using these maps to ensure that the mechanical systems of your GT-R are up to the task of supporting these Beta HP maps. Instructions on how and what parameters to data log are explained in this GT-R Beta HP Data Logging Instructions document as well as how to evaluate performance to determine if these maps are safe to use on your GT-R. These impressive new Beta HP Off-The-Shelf maps can be downloaded from the special Nissan GT-R HP Map Database, which reminds you of the special attention required to ensure your vehicle can take advantage of these maps while maintaining adequate safety margin. Please visit the Step-By-Step AccessPORT Firmware Update Instructions page to guide you through the firmware update process. Please visit the Step-By-Step AccessTUNER Update Instructions page to guide you through the software update process. Please visit the Step-By-Step AccessPORT Map Download and Install Instructions page to guide you through finding maps, downloading them to your computer, transferring them to your AccessPORT and flashing a new map to your ECU.